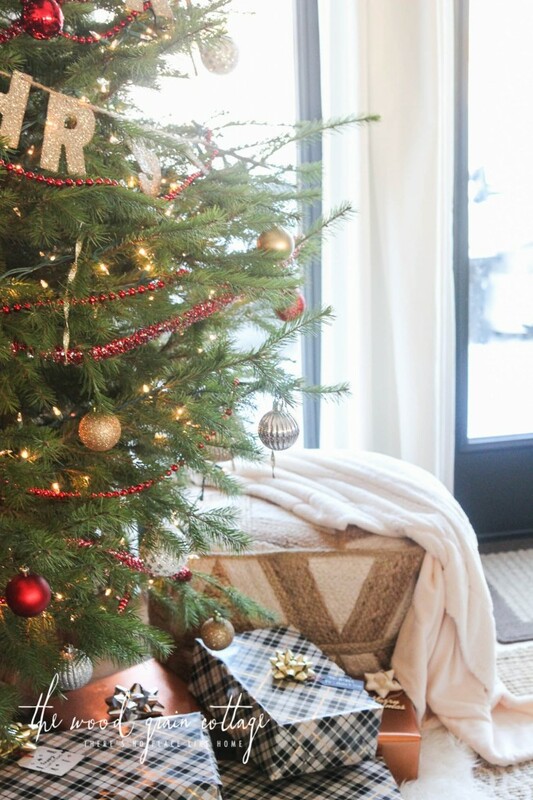 Today I’m sharing our Christmas home tour: Part two. Last week I shared the first part of our home tour, and today I’m back to share the final part. I have had so much fun decorating our home this year. I’ve kind of just let it happen. I had a tiny plan, but other than that, I let it decide itself as I started placing things around the house. Since we focused on the kitchen and breakfast nook in the first part of the tour, I’ll share a few pictures of those rooms just to remind you where we left off. I will admit, I’m a pretty simple gift wrapper. I love pretty gifts, but I think they can be beautiful, simply. I also brought a lot of texture to this room by mixing and layering different rugs. I love the combination of them all. The new patterned rug is from Wayfair. Love, love, love! The home sweet home pillow is a DIY project. You can find my tutorial here. This room is still very much a work in progress, but I am loving how it’s shaping up. Lovely. And, connected to the entryway, is our dining room! Some fresh bundles of greenery, and this room was festive! I used my same DIY sign from a few years ago (I still love it! ), because, how true are those words? And just in case you’re wondering what it looks like outside, here is our view. I love our life. Disclosure: Thank you to Wayfair for providing some of our beautiful items! All opinions are my own. Looks gorgeous as usual! I love the two trees and the framed grain sacks look fabulous! 🙂 Good work being almost done with your gifts… I’m just about done too, such a freeing feeling! Oh my gosh your home is so beautiful! I’m obsessed with your open shelving. Love the more natural look. I went with red and black plaid this year.. I miss that sometimes. Your home is comfortable looking.. Thanks for inviting me..
Love all your subtle Christmas touches… and your fab, fresh FAT trees!!!! Perfect for getting cozy and gazing at!! Everything is absolutely beautiful! I really enjoy the holidays, especially sitting in the evening with just the lights on the tree. Magical!! I fell in love with your rug from Wayfair. Do you remember the brand and colors? Thanks! I love the Christmas pennants and the plaid! Pretty and understated. Have a blessed Christmas! I love it. The planking is amazing, and I think it highlights all the festive. The layered carpet is brilliant, and I’d easily be tempted to buy that little rug. Gosh your house is beautiful, it looks like a showroom, except homey! I love your kitchen chairs! Back on the contest widget they asked us to post on your site what we would buy from Wayfair if we won (which is confusing because no one else seems to be doing it). Well, I would get the Oxford Console Table and paint it red; not for Christmas, just because! Love your house! So pretty & festive! Love the shelving unit in your dining room! Thanks for the giveaway! If I won I would buy a coffee table.